“We have brought torture, cluster bombs, depleted uranium, innumerable acts of random murder, misery, degradation and death to the Iraqi people and call it ‘bringing freedom and democracy to the Middle East’. How many people do you have to kill before you qualify to be described as a mass murderer and a war criminal? One hundred thousand? More than enough, I would have thought. Therefore it is just that Bush and Blair be arraigned before the International Criminal Court of Justice” . Unfortunately the International Criminal Court (ICC) as currently operating is a politically complicit entity that strictly confines its war crimes attention to war criminals that the US Alliance doesn’t like. (for discussion see “The Politics of Genocide” by Edward S. Herman and David Peterson [23, 24]). The ICC has repeatedly ignored complaints over the Iraqi Genocide (e.g. [25, 26] and that means the world must accept recourse to eminent international people’s tribunals to assess the war crimes of the US Alliance in Iraq and elsewhere. 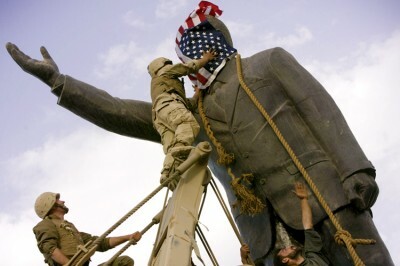 US state terrorism, UK state terrorism, French state terrorism, Apartheid Israeli state terrorism among others have variously combined over the last 25 years to destroy Iraq as a united, sovereign, modern state. In the face of endless war against Iraq and an ongoing Iraqi Holocaust and Iraqi Genocide, what can decent people do? Those with consciences recently marked the 12th anniversary on 19 March 2015 of the illegal and war criminal US, UK and Australian invasion of Iraq in 2003 that was based on false assertions of Iraqi possession of Weapons of Mass Destruction, was conducted in the absence of UN sanction or Iraqi threat to the invading nations, and led to 2.7 million Iraqi deaths from violence (1.5 million) or from violently-imposed deprivation (1.2 million). The West has now commenced its Seventh Iraq War since 1914 in over a century of Western violence in which Iraqi deaths from violence or violently-imposed deprivation have totalled 9 million. However Western Mainstream media have resolutely ignored the carnage, this tragically illustrating the adage “History ignored yields history repeated” . Western Mainstream media utterly ignore expert assessments of how many people the US Alliance has killed in Iraq and resolutely ignore the crucial epidemiological concept of non-violent avoidable deaths (excess deaths, avoidable mortality, excess mortality, deaths that should not have happened) associated with war-imposed deprivation (for detailed analysis see ). “The withdrawal ends a war that left tens of thousands of Iraqis and nearly 4,500 American soldiers dead” . In contrast, the US Just Foreign Policy organization estimates, based on the data of expert UK analysts and top US medical epidemiologists, 1.5 million violent deaths in the Iraq War (2003-2011) [4-7] and UN data indicate a further 0.8 million Iraq avoidable deaths from war-imposed deprivation in this period . Violent deaths and avoidable deaths from violently -imposed deprivation in the Gulf War (1990-1991) and Sanctions period (1990-2003) total 0.2 million and 1.2 million, respectively . Accordingly, Iraqi deaths from violence (1.7 million) or war-imposed deprivation (2.9 million) since 1990 total 4.6 million . “In the present Convention, genocide means any of the following acts committed with intent to destroy, in whole or in part, a national, ethnic, racial or religious group, as such: a) Killing members of the group; b) Causing serious bodily or mental harm to members of the group; c) Deliberately inflicting on the group conditions of life calculated to bring about its physical destruction in whole or in part; d) Imposing measures intended to prevent births within the group; e) Forcibly transferring children of the group to another group.” . Any argument that the British and Americans did not “intend” to kill 9 million Iraqis is belied by the remorseless slaughter over 101 years interrupted only by the period between the overthrow of the British-installed monarchy in 1958 and the commencement of Sanctions in 1990. Iraq has been substantially destroyed as a modern state by US state terrorism, with the participation of its allies including Britain, France, Israel among others. The same state terrorists have been variously involved in the similar destruction of Libya and Syria. These are unforgivable crimes and the US Alliance war criminals must be brought to account by the world through international law and through application of Boycotts, Divestment and Sanctions (BDS) against the war criminal Western states responsible for the Iraqi Holocaust and Iraqi Genocide. Dr Gideon Polya has been teaching science students at a major Australian university for 4 decades. He published some 130 works in a 5 decade scientific career, most recently a huge pharmacological reference text “Biochemical Targets of Plant Bioactive Compounds” (CRC Press/Taylor & Francis, New York & London , 2003).
. ORB (Opinion Research Business), “January 2008 – Update on Iraqi Casualty Data”, January 2008: http://www.opinion.co.uk/Newsroom_details.aspx?NewsId=88 .
. Les Roberts, “Les Roberts: Iraq’s death toll far worse than our leaders admit”, Uruqnet: 14 February 2007: http://www.uruknet.de/?s1=1&p=30670&s2=16 .
. Jog, N.G. (1944), “Churchill’s Blind-Spot: India”, New Book Company, Bombay.
. Madhusree Muckerjee, “Churchill’s Secret War. The British Empire and the ravaging of India during World War II” (Basic Books, New York, 2010).
. SEARCH Foundation, “ Australia’s former Prime Minister Howard accused of war crimes before the International Criminal Court in The Hague”, Countercurrents, 7 June 2014: http://www.countercurrents.org/searchnew2.pdf .